In many cases, your MC will be responsible for announcing and running / coordinating the entertainment program at your wedding. 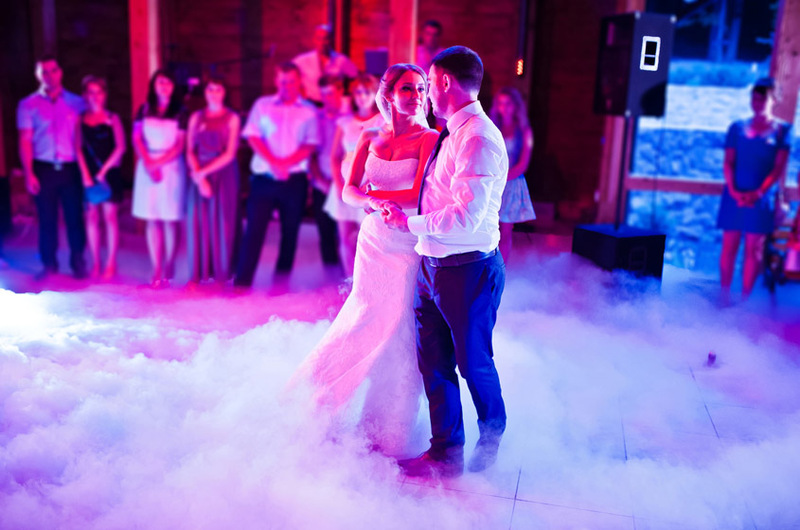 If you've hired a professional MC, they will likely already have a set of activities in mind and will customize their wedding program to your tastes - just let them know what you want to see at your wedding. 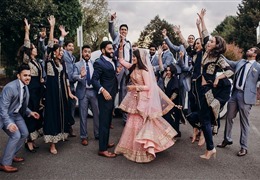 If, on the other hand, you've asked your friends to be your MC, look through some typical entertainment activities we've included below based on the top choices among other WeddingVenture.com users. The list might help your MC get a jumpstart on brainstorming the entertainment and create the best possible entertainment experience for you and your guests. Wedding games are often played throughout the reception. For instance, wedding games could fill in the breaks between meal courses served at your reception. 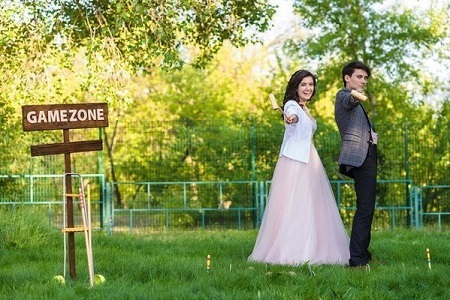 As the plates are being cleared and replaced, and as the next course arrives, the MC will announce the beginning of the new "set" of wedding games and ask for volunteers from the audience. To ensure best audience participation, ask a couple of your close friends to "volunteer" for the first couple of games just to break the ice ahead of time - a couple days before the wedding. In addition, remember to reward the winner at the end of each game. The reward should not be an expensive gift; a chocolate bar or a bottle of champagne would be enough to encourage more people to join in. 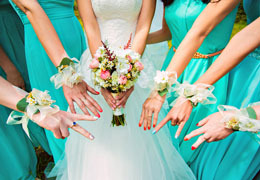 Below are a few ideas for the wedding games to try at your wedding. Feel free to use a WeddingVenture.com feedback form below to send us more examples to add! Guests are divided into two teams. Each team gets an ice cube. The goal of each team on the count of three is to melt their ice cube faster than the competition. The only requirement is that people on the team must pass the ice cube to each other without holding onto it for longer than 5 seconds (otherwise, a 10 second time penalty applies). Melting the ice cube can be done in any way: breathing on it, holding between palms, rubbing it, etc. The winner is the team that melts their ice cube the fastest. Wedding reception game "Liquid Moves"
Each participant gets a "tail" (a piece of long rope tied around the waist with the other end tied to a balloon). The end of the tail (the balloon) must be lying on the floor. The goal of the game is to "step" (and pop) on the balloons of the other participants while protecting your own tail. If your balloon is popped, you lose and must immediately leave the "battlefield." The winner is the last one standing. There is something magical and touching about sharing your childhood memories with your friends and family. It has almost become a tradition for the couple (or someone on their behalf, such as the Maid Of Honor) to put together a photo slide show featuring the couple's childhood pictures and followed by a series of photos showcasing the couple's first days, months, or years together and culminating with the pictures of the wedding preparations and possibly even a few pictures of the wedding ceremony taken earlier that day (oh, the wonders of digital photography and media). Don't know where to start? Many of our users here on WeddingVenture.com recommend using a Photo Gallery feature of Windows Live (it's free) to create a visual photo slideshow quickly. Similar software is available from all kinds of vendors for many platforms. It would even be better if the lyrics actually went with the pictures. Pick 3 or 4 different songs to "partition" your slide show into 3 or 4 logical sections. Each song would pertain to a particular period of your lives shown in pictures. 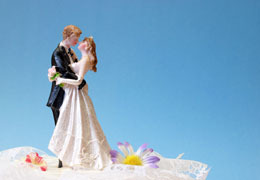 We have some ideas for the background music for your wedding reception or dinner slide show. 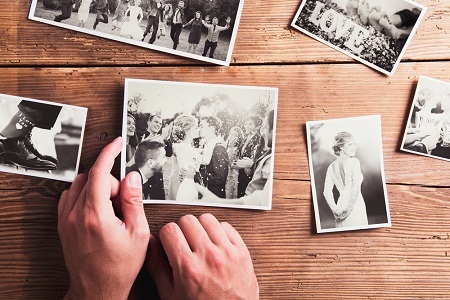 For instance, play something light when showing your early childhood photos, and then play something slower and more romantic when switching to the pictures of when the two of you first met. We know you and your mother can probably leaf through your childhood pictures all day long, and if you try, you can keep it down to an hour or two. That is not true for your guests, so keep your slide show to about 5-7 minutes. Make sure to test run the slide show at least once on the audio / video equipment you will actually be using at your wedding. Not only may the AV equipment be broken, it may be that the current equipment settings will cause your slide show not to display correctly. For instance, in case of Jill & Patrick's wedding, as an example, the music ended up not playing and even through the slide show was running, due to incorrect resolution the top and bottom of each picture was cut off - so the guests were subjected to 5 minutes of viewing of unknown headless and legless bodies.